Certainly one of the most popular rooms in the home to have remodeled is the bathroom. There are a host of great bathroom design ideas to give the space great flair. However, at the same time, the prospect of messing it up leads that same room to be especially anxiety inducing among prospective DIY projects for home. That need not be. We offer here some DIY bathroom remodel tips to help you achieve the DIY bathroom remodel of your dreams. As with most any DIY project, a great deal of future headache and heartbreak can be avoided by a little present planning. It will help you cut costs and save time. Methodically, plan the steps for your project in advance. Doing so will alleviate your fears, allowing you to enter the remodeling project with confidence. Start by acquiring the information you need to become an informed consumer. Research items you’re considering purchasing for you project. Take an inventory of which bathroom items you may be able to reuse or recycle: things like fixtures, mirrors, shower doors and cabinetry. Always expect the unexpected and keep some backup funds salted away to take care of any unanticipated mishaps. It is often, wrongly, presumed that a successful DIY bathroom remodel project calls for the entire replacement of everything with brand new items: from the bathtub to the bath sink. In fact, though, you can save a pile of dough, while still getting a great new feel bathroom, by going the refinishing route. Usually a complete renovation will require hiring a professional. The DIYer, though, can still get great results without such professional work. 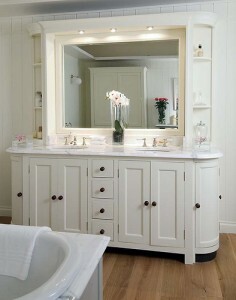 Most of the items in your current bathroom can be part of a DIY refinishing project. Reconsider them all: bathtubs, showers, spas, tile (shower, floor, and wall), vanity countertops and marble. Rather than splurging on a new bathtub, refinish a tub for much less and put another 10-15 years use back into the original piece. In the business, if you’re doing your research, be aware that refinishing is also referred to as reglazing, resurfacing or renewing. Many people are concerned these days about water conservation in remodeling of the bathroom. If this is you, consider a low flow toilet. Typically, they will use no more than 1.28 gallons per flush. High efficiency toilets are not cheap, but in the long run they will save you money on the water bill. The standardized toilet will flush about twice as much at 3.5 gallons. Now here’s an idea: why bother with the arduous search, far and wide, for the perfect individual pieces for your bathroom counter tops. Instead, put your effort into finding the right vanity kit, ready to assemble. It’s common to get the vanity base, counter top (vanity top), sidings, and faucets in one complete kit. You can get more bang for your buck by purchasing the right high-end faucets. Beautiful faucets certainly help raise the resale value of your home while also conserving water. A flow rate of 1.5 gallons per minute or below is considered a good candidate. The flow rate is usually determined by the aerator. Some products on the market will be found to feel “wetter” – an experience generated by the flow pattern. Again, a little preparatory research can go a long way. And don’t forget the advantages of having a great showerhead! We hope these DIY bathroom remodel tips give you the bathroom design ideas that help achieve success in undertaking and succeeding at one of the most precious DIY projects for home and family.